Drivers flock to the O'Reilly Auto Parts Friday Night Drags every week throughout the summer to see the fastest souped up muscle cars, pro drag rail cars and everything in between. Riders also saddle up in the four bike divisions to determine the fasted competitor on two wheels. High speeds and quick reflexes aren't just reserved for the seasoned veterans in the QuikTrip Pro and Super Pro vehicles each week. With speeds topping 100 mph over the 1/8th mile pit land drag strip, even newcomers are not deterred to see how they stack up each week in the bike divisions. "This is my first year doing it," said Austin Strother of Hampton. "I've been coming since the first weekend that it opened this year. I just got a bike that's kind of suited for this." He isn't the only newcomer to jump on a bike in 2018. After competing in the sports compact class each of the past four years, Rickey Temples of Williamson made the switch to the Sport Bike division. "It has a built motor. Makes 218 horsepower, 121 foot pounds of torque to the wheel," said Temples of his black 2012 Suzuki Hayabusa. "It's all motor, but its stock length, stock height." Also piloting a stock bike, Strother is also facing stiff competition in the Motorcycle class on his 2009 Yamaha. "It's just a small commuter bike but it can still compete with some of the sport bikes," said Strother. "I don't have any other bikes in my class that comes out in a stock bike. Everyone else runs stretched." But it isn't the wins and losses on the drag strip that keep the new bike competitors returning to Friday Night Drags Stother explained, "The fact that we get to do burnouts, have a good time and hang out with people and get to go fast." For Temples, it's about the comradery of his fellow competitors and the extra incentive among your friends of knowing who is faster at the end of the night. "Come out here and everyone wants to talk to you, get to know you and have a little bit of fun," said Temples. "And when you can go against your friend and get that little extra respect points because you are faster is always better." 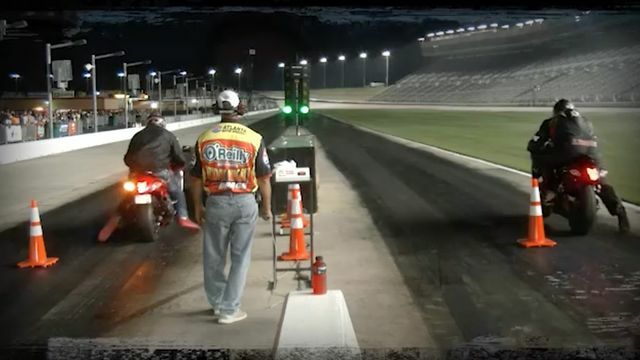 The point season continues this Friday as Drivers and riders return to the pit lane drag strip at Atlanta Motor Speedway in week five action of high-intensity, side-by-side competition on the famed pit-lane drag strip.